The GOOD OMENS Trailer Is Here To Bring About The Apocalypse | Birth.Movies.Death. 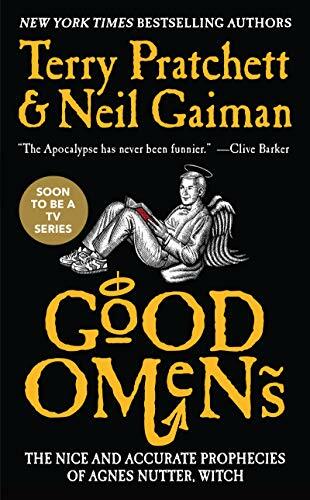 If it feels like we've been talking about Amazon's forthcoming Good Omens adaptation for years, it's because we have: a glance at the Birth.Movies.Death. archives reveals we've been following the production on this one since 2017. Good God. We were all so much younger and hopeful then, weren't we? I mean, not by much, maybe, but certainly moreso than we are now. Well, first things first: this thing's got one helluva cast! In addition to Michael Sheen and David Tenant (playing two mismatched angels forced to form an unlikely alliance in order to stop the apocalypse from happening), you've also got Jon Hamm, Nick Offerman, Jack Whitehall, Miranda Richardson, Adria Arjona, Michael McKean and many more. This is a murderer's row of talent, and everyone involved seems to be having a blast. In our experience, that's generally a good sign. That said, we must confess that some of the VFX look a bit ... dodgy. There are effects shots in this trailer that look about on par with, say, Nickelodeon's Are You Afraid of The Dark?, which seems a little surprising, to say the least. We're not terribly worried about this - they do have several more months to fine-tune everything! Fingers crossed that that's the plan. Otherwise, this looks like a lot of fun, and we'll definitely be tuning in when the series hits Amazon Prime on May 31st. How 'bout y'all? Sound off in the comments below.